Gearing Up for the Battle in Philadelphia | Democracy Now! Deputy Commissioner Robert Mitchell, of the Philadelphia Police Department. Rev. Vernal Simms, Pastor of Morris Brown AME Church. AMY GOODMAN: Today on the program, we’re going to take a look at the preparations for the Republican National Convention in Philadelphia, as well as what’s happening in Los Angeles with the Democrats. Activists have been conducting training exercises and workshops for the planned street protests, while Philadelphia police, as well as federal agencies like the FBI, have been conducting their own training. We’re joined on the telephone right now by Deputy Commissioner Robert Mitchell of the Philadelphia Police Department. 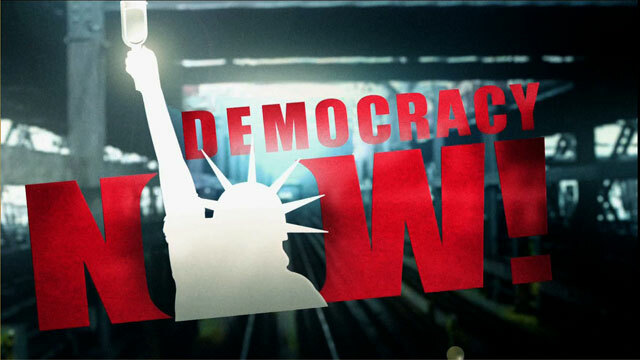 Welcome to Democracy Now! AMY GOODMAN: Well, it’s good to have you with us. There have been major protests that have been taking place. I guess top police officials ran into the wrath of the community just two nights ago at a community meeting over the beating of the African American man at the hands of a group of police officers, some are saying a mob of police officers. And your Police Commissioner John Timoney faced down this angry crowd, where black leaders were demanding answers over the beating of Thomas Jones. How are you dealing with this building protest, in light of the — we’re just days away from the Republican Convention? ROBERT MITCHELL: Well, I’m not so sure I agree with it’s a building protest. It’s not lost on us that are in involved in the planning of the RNC. It never has been lost on us, because that was just simply one aspect of it. The other equally — area of concern for us was the strong presence of the media, the tremendous quantity of video cameras that are going to be out there, both the media and both by the protesters’ own media system. And all this is — I don’t say so much the national media, but I know with regard to the demonstrators’ media system, it’s going to be a “gotcha” kind of an arrangement. But I really — I don’t want to make it sound in my remarks like it’s us against them, and I don’t want to move in that direction. AMY GOODMAN: We’re also joined by Sara Scully, who is founder of I-Witness Video, who is in studio here with us in New York conducting trainings of video activists to monitor the activities of police. A “gotcha” arrangement? SARA SCULLY: I’m not quite sure I’m clear on what that means exactly. Could you clarify that for me? ROBERT MITCHELL: Sure, I have no problem clarifying that. Just observe some kind of a situation developing between either a demonstrator/protester and a police officer or police officers and just watching it take form, the possible shouting of the word and trying to just get the police officers sufficiently worked up to generate a reaction and just stay there, be patient, and just watch it develop. And then, when it develops, that’s when the picture is taken, that’s when the video is put on “on,” not in advance of it, that shows what may have led up to it. Now, that does not mean that the police officers or police reaction to it is anything that we’re pleased with. AMY GOODMAN: Sara Scully, what are your reasons for putting video cameras on the streets and training activists to go down. SARA SCULLY: Well, our experience, coming out of Seattle and the protest in Washington, D.C. is not that the protesters get the police worked up; it’s that the police actually corner the protesters and get the protesters into a situation where they’re provoking frustration on the part of the protesters. No protester wants to provoke being hit and kicked and beaten by a police officer, and my personal experience being a media person in D.C. was witnessing this police brutality, and while I was filming it, the police turned on me and hit me. AMY GOODMAN: This was during the World Bank/IMF protest? SARA SCULLY: Yes. And when that officer hit me, I realized that we not only need to have people filming the police so that we get these things on camera, but we need to have people who are trained and skilled in how to avoid the police turning on them. So, when you say, you know, the protesters getting worked up and setting the cops up, it’s really the other way around. So our intention is to have a team of people who are trained and skilled in how to keep themselves focused and calm and safe and focus particularly on the police and what they are doing. ROBERT MITCHELL: Well, that goes to heart of my thing, particularly on the police. In other words, the police, without any kind of provocation, without any kind of reason, all of a sudden just get turned loose, so to speak. I happen to have been in Washington for those two days, and there was a great deal of frustration on the part of the demonstrators, because I was back behind the barricade lines. AMY GOODMAN: You were observing what was happening there in preparation for the Republican Convention? ROBERT MITCHELL: Yes, in that respect, yes. But my take on it, and, of course, you know, Sara and I are coming from two different perspectives here, and what it was, it was just a deep sense of frustration that the police were thwarting them in their efforts to try to carry out, you know, their mandate, their mission. What they wanted to do was to interrupt both of those functions that were occurring that weekend. AMY GOODMAN: Let me follow up, for a minute, on the issue of the Philadelphia police, you going to Washington to observe the protesters during the World Bank/IMF protest. We also had a report in the beginning of May that the New York police worked with the Philadelphia police, who came up for a May Day rally and that undercover Philadelphia cops photographed about twenty demonstrators at the May Day rally, part of Philadelphia police strategy to identify troublemakers who they said are planning to attend the Republican National Convention. That was actually a paraphrase of Philadelphia Police Commissioner John Timoney. Are you going to places like New York and photographing protesters in preparation? ROBERT MITCHELL: Are we? No. Had we? Yes, that particular occasion. ROBERT MITCHELL: For just the reason you just cited. You know, for the reason the commissioner just gave. SARA SCULLY: I want to go back to this other issue of — you know, you brought up this dynamic between the protesters getting frustrated and, you know, the police acting on the protesters because the protesters are acting out. The fact of the matter is, no matter what protesters are doing, whether doing civil disobedience and exercising their right to free speech in the streets or whether they’re locking down somewhere, or even whether they’re breaking a window, the police have no right to beat protesters and to brutalize protesters. And that’s what we’ve seen time and again in Seattle and D.C. And that is what we’re concerned about in Philadelphia. The police have no right, when they’re apprehending an individual, whether they’re legally apprehending that person or illegal, no matter what the grounds are, they have no right to brutalize that individual, and that’s what we’ve constantly seen. And I think that’s what you need to focus on. AMY GOODMAN: Deputy Police Commissioner Robert Mitchell? ROBERT MITCHELL: How can I quarrel with that? Who can argue with that? I’m not arguing — I mean, I’m not disagreeing with Sara [inaudible]. SARA SCULLY: Well, then, can you explain why it happens time and again? You’re a professional in this field. I’m sure you’ve been a distinguished professional in this field for many years. You tell me. I mean, I know that the police, the culture is not a lone ranger culture. It’s not a guy making a decision to beat somebody. Everyone’s dispatched. It’s like a football team. You have a strategy. You deploy men in certain areas, and women of the police, to quell protests. Then why does this happen? Are you telling me everybody’s in a bad mood, so they decide to beat on people? ROBERT MITCHELL: Sara, you know, I don’t think we’ll ever completely see eye to eye on all the issues here, but let me get back to your issue. When we talk about the protesters, do you have any problem accounting for all of the behavior of all of the protesters that can be under a particular group, that you’re willing to account for all of their behavior and speak for all their behavior? No! Are there not a certain element within that demonstration group that present a problem for the organizers, that give them some gray hair, that give them some embarrassment? ROBERT MITCHELL: I mean, you set out not to do that, don’t you? Don’t they set out to run a peaceful, orderly event, to try to get the message out? ROBERT MITCHELL: But doesn’t it sometimes go awry, because of the frustration of some of these other people? SARA SCULLY: May I respond to you? Deputy Commission Mitchell, the fact of the matter is, I don’t have to account for the individuals who are protesting. I don’t license them to have guns and badges. I don’t train them to arrest individuals in a civil manner, and when they sign up to do that, they’re not signing up to do those activities in a civil manner. They each are accountable to themselves, and they each speak for themselves. I don’t speak for the protest movement, but your police officers have badges and licenses, so that makes it even more important for them and you to be responsible for their activities. AMY GOODMAN: Deputy Police Commissioner Robert Mitchell and Sara Scully, founder of I-Witness Video, we are also joined on the telephone by Reverend Vernal Simms, pastor of the Morris Brown AME Church in Philadelphia. He is one of the black clergy who were at the community meeting two nights ago, where leaders in Philadelphia were demanding answers over the beating of Thomas Jones. Reverend Vernal Simms, can you talk about your concerns right now involving the Philadelphia police? REV. VERNAL SIMMS: Yes. Well, our concern involving the Philadelphia police at this point is the fact that we just want a fair investigation into the matter. People characterize us as defending Thomas Jones. We are not defending Thomas Jones. He needed to be apprehended. We are not defending him, but we are defending his civil rights. We are defending the fact that he was shot four or five times, the fact that he was beaten, kicked and dragged away in a headlock, not put in an ambulance going to the hospital, but put in a car going to the hospital. So our concern is the fact that — of his civil rights. We are not defending him. AMY GOODMAN: Deputy Police Commissioner Robert Mitchell, in addition to the actual beating of Thomas Jones, you had the situation a few days ago of a police officer out of a precinct selling these T-shirts of the beating that was caught on videotape, where it said ”RNC Welcoming Committee” and on the back — and it has a picture of a police badge — it says “Welcome America,” with the commander of the precinct not objecting. What’s happening here? ROBERT MITCHELL: OK, well, thank you very much for the opportunity. AMY GOODMAN: No, no, no. If you can stay with us for one minute, we just have to break for a minute for stations to identify themselves, and we’d like to take two more minutes of your time. Is that OK? AMY GOODMAN: OK. You are listening to Pacifica Radio’s Democracy Now! We’re talking with Deputy Police Commissioner Robert Mitchell, also Reverend Vernal Simms, and Sara Scully. We’ll be back in a minute. AMY GOODMAN: As we talk about plans for Philadelphia, the Republican National Convention begins on July 31st. Democracy Now! will be there broadcasting daily live programs. Deputy Police Commissioner Robert Mitchell, a question about your plans next week: Will you be using or will the Philadelphia police, do they have plans to use pepper spray, tear gas or rubber bullets? ROBERT MITCHELL: I doubt it, just, no. AMY GOODMAN: Has the police commissioner made a pledge that they will not use these chemical agents? ROBERT MITCHELL: No, what the police commissioner has said, and the reason I’m so quick to say no to you, Amy, is that the only case that gas of any type would be used, if we’re absolutely in a riotous situation. Absent that, it will not be used. AMY GOODMAN: And what about the opening of the Holmesburg Prison, a notorious prison in Philadelphia, now only used by filmmakers looking for dungeon-like conditions for their movie sets. It was closed down, and word is that it will open for the protesters. ROBERT MITCHELL: Where did you get the word “dungeon-type conditions”? AMY GOODMAN: That filmmakers use it? ROBERT MITCHELL: Yes, no, but you use the word “dungeon-type conditions” there. It’s a little dramatic word to use, isn’t it? I wouldn’t characterize it that way. But to answer your question anyway, Amy, we have been forced, out of shear necessity in preparing for this thing, to be prepared for a worst case scenario. Obviously, any police department’s wish would be that you don’t have a worst case scenario, but we’re obligated to plan for it, and in the event that the number of people that might get arrested exceeds the capacity of the police headquarters building to properly handle them, we have to have a facility where prisoners can be brought to ’til such time as they can be brought to police headquarters for processing. AMY GOODMAN: Reverend Vernal Simms, pastor of the Morris Brown AME Church, are you comfortable or feel confident about police behavior in these next few weeks, in light of what has happened in the last week? REV. VERNAL SIMMS: Oh, yeah. Let me say that I must give Commissioner Timoney credit in the fact that as soon as this issue happened, he touched base with us. We went in and met with him, and in a matter of two days, we met three or four times, along with him and the mayor, and we are not, by any means — we want to make it clear that we want to live in a safe Philadelphia. We are not saying that all of the police are bad or all of the police are racist, and we just want those bad apples that are in the police department to be taken out of the police department and to be prosecuted — arrested and prosecuted for what they’ve done. We are looking forward to the Republican National Convention coming to Philadelphia. Philadelphia is a wonderful place to be and to live, and we want them to come in and enjoy themselves, spend their money and help our economy. AMY GOODMAN: Sara Scully, founder of I-Witness Video, you’ve been training activists to video police behavior and activities on the street. Your final concerns? AMY GOODMAN: This is the National Lawyer’s Guild report? SARA SCULLY: Yeah, ACLU report. One of the main findings was that police were not given adequate time to rest, they had been working overtime, and they hadn’t been given adequate breaks for food. And I understand that, you know, there might be a promise to give police breaks, but I feel like I, you know, I’d like that concern addressed about the fact that police have been working overtime and in conditions in late July, when it’s going to be eight hours in the sun, maybe in turtle suits, you know, riot gear. How are the police going to deal with that? I mean, that’s just a basic logistical issue that can make people’s tempers really hot and not good conditions for people thinking clearly and abiding by civil procedures for arrests. AMY GOODMAN: Deputy Commissioner Robert Mitchell? AMY GOODMAN: A turtle suit is…? ROBERT MITCHELL: I know the black clothing, very ominous looking stuff, all that black gear. ROBERT MITCHELL: First of all, it’s oppressive, and as Sara said, rightly so, on the East Coast here, it’s like being down in Florida. It’s very, very hot and humid. It’s not lost on us here. To the extent that circumstances permit — I mean, circumstances are going to dictate a lot of these things, but we’re planning to ensure that they’re well hydrated, they’re well fed, and trying to plan for release. We’re a much larger police department than the City of Seattle, and we have committed more resources to this project, lesson learned from Seattle. And the other point of it, too, is we’re concerned about the fact that they could possibly be stressed, and as Sara rightly brings out, it’s a legitimate point, that they start to get edgy, and that’s not in our best interest to have that happen. It’s not. AMY GOODMAN: Question, on the Philadelphia city council ruling that people who wear any face covering, like bandanas, will be fined seventy-five dollars. What is that about? ROBERT MITCHELL: It’s something that’s just not worth talking about, because — what I mean by that, Amy — and I’ve had some discussions with the ACLU on that — we’re not going to be going out and as we see people that’ll choose to wear that just pick them up and have them brought before a judge and fined for that. We’re not looking to do that, but what I would say that if somebody engages in criminal conduct and they are wearing a mask, that charge under the city ordinance will certainly be applied against them. SARA SCULLY: — one of them actually said, quote/unquote, about the protesters, “Well, I’m not looking forward to getting piss thrown at me,” and they all laughed as if this was something they had all understood as a joke. And I’m just wondering where police are getting their information about protesters and about how they may behave. And I reminded them that, well, no piss had ever been thrown in Seattle or D.C., and D.C. was fairly peaceful, and there wasn’t any riotous violence. So, you know, I’m just wondering sort of what the cops’ attitudes are and just hoping that the police understand what the protesters are doing and why they’re there and not have this sort of maybe power of presumption that can also cause problems with the police. ROBERT MITCHELL: Sara, it’s in our best interest not to have confrontation. We don’t gain from that, and I would submit to you that the protesting community does not gain from it either, because the focus will not be on the issues that they feel so strongly about, but it will be on the confrontation and the subsequent arrests and police action that follow. So, it’s not in our best interest. We are trying very hard. 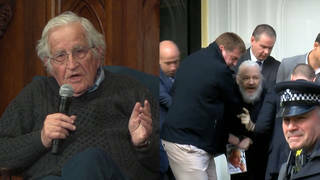 It’s in my best interest as the overall commander to ensure that we arrest as few people as possible and, of course, in the ideal world nobody getting arrested. We do not want confrontation. It is not in our best interest. AMY GOODMAN: Reverend Vernal Simms, is there a rally planned at your church on Sunday, the Morris Brown AME Church? REV. VERNAL SIMMS: Yes, we’re having a rally on this Sunday at 7:00 p.m. at the Morris Brown AME Church at 25th and Montgomery in North Philadelphia, and we’re having a prayer rally for the ecumenical community and the City of Philadelphia. AMY GOODMAN: On that note, I want to thank you all for being with us, Reverend Vernal Simms, pastor of the Morris Brown AME Church; Deputy Commissioner Robert Mitchell of the Philadelphia Police Department; and Sara Scully, founder of I-Witness Video, who’s conducting trainings of video activists to monitor the activities of police in Philadelphia.